The first day of 2015 in Badami was cold. I was clinging on to a rocky overhang about 70ft high, petrified and with no strength to move. My arms were ‘pumped’ – meaning, lactic acid had built up in my forearms due to the strenuous climbing. I was sweating profusely despite the cool breeze that was now threatening to throw me off the rocks. Faint voices drifted from below, encouraging me to keep climbing. But they were merely words written in thin air in my foggy mind. Inevitably, my hands slipped from the rocks. The rope latched somewhere above and attached to my harness, broke my free fall, but my belayer (who controlled the rope from below) could not stop me from swinging like a pendulum. I suppose I had screamed, or maybe I only screamed inside my head. Later my friends told me that I had enough presence of mind to stop my swing using my arms and legs and therefore protected myself from crashing into the rocks. I remember feeling my legs wobbly on the ground. My belayer had brought me down safely. I felt somewhat embarrassed, disappointed with my own performance. And wondered whether I would ever get another chance to climb up those rocks and be strong enough to do it well. That thought is perhaps what got me hooked on to the sport of rock climbing in India. For centuries, the idea of conquering mountains has obsessed men and driven many to their untimely deaths. Mountaineering was pioneered in the West, but most Western climbers looked Eastward for their greatest challenge. One of the most famous of the tribe being Edmund Hillary, a New Zealander, who summited Mt Everest in 1953 along with Tenzing Norgay, a mountaineer from Nepal. Somewhere along the way, some of the Alpinists of the world recognised their obsession for climbing rocks and popularised it throughout the world as an autonomous sport. It was only a matter of time before India followed suit. Rock climbing came to India in the 1960s disguised as a necessary skill for mountaineering, which was the rage amongst adventurers back then. The sport was actively promoted by the mountaineering clubs that dotted the country. Mountaineers practiced ‘aid climbing’, which meant climbing the rocks with the help of equipment (imagine climbing up using rope ladders). A few years later, ‘free climbing’ was introduced. Here, the climber used his/her arms and legs to crawl up a rock face a la Spider Man and the equipment (ropes, harnesses, carabiners, etc.,) were only used to keep them tethered to the wall in case of a fall. And fall they would. But the idea was to pick themselves up and train harder and harder until they were able to reach the top without taking another fall. The sport eventually took a competitive turn and the first competition in India was conducted in the winter of 1993 at the Indian Mountaineering Foundation, New Delhi. By then, artificial walls with plastic holds had been introduced and the activity came to be called ‘Sport Climbing’, distinguishing itself from its better half, ‘Rock Climbing’. Many rock-climbing enthusiasts hoped that these artificial walls would be used as training platforms to conquer harder climbs out on the rocks in nature. But what happened was that they gave rise to a new generation of climbers who focused all their attention on Sport Climbing and the myriad competitions that surrounded it. “I was introduced to climbing when I was in school. I saw Praveen Sir (Praveen CM, the only Indian climber to have won National Climbing Championships 16 years in a row) win 3 gold (medals) in 2008. I cried watching the event. I thought to myself that I would grow up to become a champion like him,” says Ajij Sheikh, who did grow up to be the champion he had always wanted to be. For Praveen, a chance encounter with rock climbing during a school excursion got him interested in the sport. His innate skills and effortless talent quickly saw him soar onto the top of his game. The sandstone rock of Badami is hidden within the hinterland of Karnataka and is one of the most beautiful natural wonders of India. The rugged, red outcrop rises above a ravine in blazing glory, with a history that dates back by 2.5 billion years. Silhouetted against the blue backdrop of the sky, is a dark, chiseled figure hanging on the edge of a boulder about 15 feet high. There are no ropes to protect him, no bed to cushion his fall. In one swift, impossible move, the man just hauls himself to the top of the rock. A huge sigh of relief seems to breeze through the small crowd of onlookers. Some clap in meek respect. The man simply stands up, dusts the chalk powder off his hands, and starts to make his way down the boulder as though what he just did was just as simple and ordinary as walking up a flight of stairs. 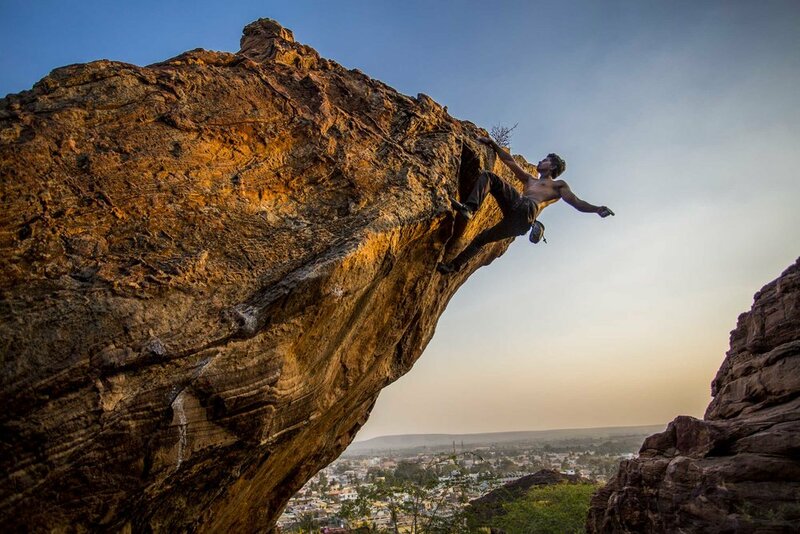 This is home turf for rock climbers in India. Here, in Badami, I’ve met some of India’s best climbers and also renowned climbers from abroad. For these men, the most vital lessons in climbing come from nature. “I go to the rocks to learn moves, so that I can implement them in sport climbing,” says Praveen. 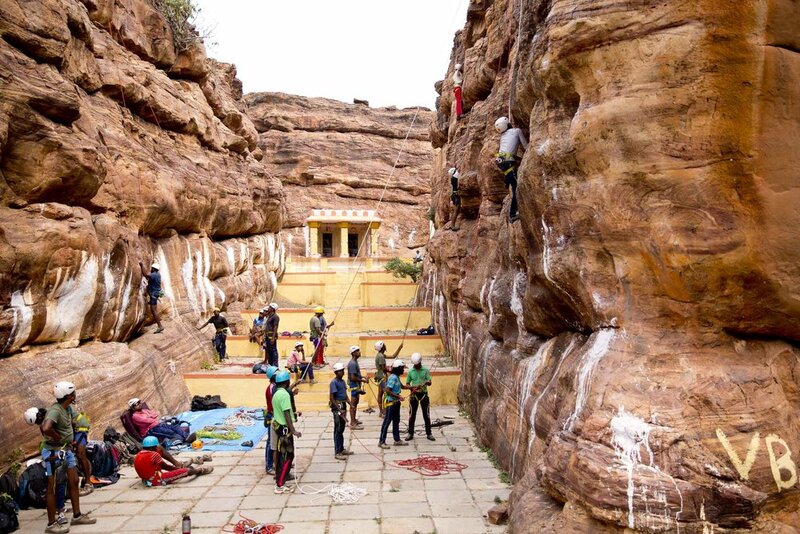 “We do sport climbing and participate in competitions because that is where we get maximum exposure.” He has been climbing in Badami for the past 15 years and says that this has been his training ground. “The sandstone is much more kind on your fingers than granite; which is found in Hampi. This advantage allows us to climb harder and longer on the rocks” Although the bulk of amateur climbing seems to happen on artificial walls in cities due to the constraints of urban lifestyles, many young professionals drift to Badami and Hampi (a treasured locale of boulder climbing in India) for their yearly rock climbing pilgrimage. Gaurav Kumar, a climber from Delhi, says he trained for three years in Badami before he could complete India’s hardest climbing route, called the Ganesha (also in Badami). For Pune boy Ajij Sheikh, who is the reigning National Champion, Hampi is his favorite, owing to the variety of “boulder problems” available there. Karnataka is arguably the capital of climbing in India, thanks to the beautiful red rocks of Badami, the much-sought-after boulders of Hampi and a strong community of climbers from Bangalore who keep the sport alive and vibrant. But come summer, the climbing tribe, like migrating birds, flock north to Manali and Leh Ladakh to escape the scorching heat of south India. In recent years, the climbing community has also developed new rock climbing areas around cities like Bhopal, Pune, Hyderabad, Kolkata, Delhi and in Wellington (Ooty, Tamil Nadu) and Mount Abu (Rajasthan). These days, Praveen is busy training the local boys of Badami in climbing. Here, he teaches basic climbing to beginners as well. There are other adventure companies, like Climb Up in Delhi and climbing gyms like Equilibrium in Bangalore who organize rock-climbing trips for beginners. “The community consists largely of warm, friendly people. Who encourage new climbers a lot. All you need to do to get started is just connect with another climber in your city,” says Praveen. With it’s small, cult like following, professional climbers still find it hard to appeal to sponsors. Ajij Sheikh laments about how your social media marketing skills determines your chances for sponsorship rather than actual climbing skills. He says, life, as a climber is a struggle in India. Unlike most officially recognized sport in India, rock climbing has no job reservations and has little or no support from the central government. Most millennial, who have excelled in their game are self-driven athletes who has had to make a living from other businesses or professions to make a living. Kumar Gaurav once told me that his family didn’t always support him in what he was doing. But as he began to get some media recognition, they started to think that, may be, our boy is achieving something in his life. “My family has always tried to discourage me from climbing. Sometimes it feels like, the whole world and everybody in it just wants me to quit climbing. But my strength is in swimming against the tide. You cannot achieve anything great without enduring hardships. If you want it easy, you cannot be a climber,” says Praveen, who also happens to be the only man in the world to have ever summited Mt Zambala, a 5850m tall, notorious peak in the Siachen Glacier, a little known fact in the adventure world. Back in Badami, though, a new generation of young climbers is racing against the rising sun to summit the red hills. I have often stopped myself, just in time, from asking some of them why they do what they do. Because as a climber myself, I already knew the answer. Because this sport is addictive. Because when you are up on the rocks, balancing all your strengths and weaknesses, challenging your fears, pushing yourself and all your boundaries into making that one move that you had thought was impossible, you experience a moment of clarity, however fleeting, and that’s when you realise that most of your life’s problems are, after all, trivial. And then, when you have come down to the safety of the hard ground, you are ready for your next big challenge. On January 7, 2016, a year and 7 days after my first attempt, I climbed the 100ft rock face, with no fall and a camera in tow. PS : An edited version of this article appeared in the JUICE Magazine.